I started this blog in 2013 with the expectation that I would not earn any money from it, I just wanted to share what I was learning about personal finance with others. I didn’t even know it was a possibility to make money off a blog. When I read other more established blogs I have found that many of them have built up fairly substantial income streams, income streams that can replace a serious amount of savings needed in retirement accounts. Relying on blog income in retirement certainly has higher risks than relying on dividends from a mutual fund, however the amount of effort needed to establish a blog generating income can be substantially less than the effort needed to generate the same amount of income in dividends. Flexibility is key in early retirement and the more income streams the better. When looking at a blog for long term income potential, do a 6 or 12 month trailing earnings average. Although I look at what my blog earns every month, a more important figure is what has my blog averaged over the past 6 months. This gives a more balanced look at what is truly happening due to advertisers that don’t pay on a monthly basis, and fluctuations in traffic and sales. In the above examples the average for Blog 1 would be $4,068 and for Blog 2 would be $1,347. I would then discount these amounts by 25% to allow some padding. These are the numbers I would use for projecting future income. For blog 1, the 6 month average is $4,068. With a 25% discount this works out to $3,051. For blog 2 the 6 month average is $1,347. With a 25% discount this works out to $1,010. The last thing you would want to do is look at the highest months and anticipate that those numbers will repeat themselves. A good amount of this variance is actually dependent on when advertisers cut their checks and when they arrive in the bloggers accounts. The blog may have accrued earnings relatively consistently, but the advertiser may only pay once a quarter, or once a certain balance has been reached. This is fairly common. Sometimes there are also seasonal differences in blog income. My blog has seen large spikes running into Christmas as well as spikes during the summer, as a few of my more popular articles are for building outdoor toy structures. Bottom line: Be very cautions of seeing a peak earning month and planning on it continuing. The biggest advantage of starting a blog for income over a long term horizon is that the barrier to enter is extremely low. For under $50 you can start a blog today and pay for it for the entire year with a free domain name at GoDaddy.com. The first year is a bit cheaper than subsequent years, but I still pay under $150 per year for hosting and domain name registration. Beyond a small amount of money all you need is a bit of spare time and some ideas for great content that can help other people. It doesn’t cost anything to sit down and write for 5 hours. With several months of part time effort your blog should start generating some income. After 5 – 10 years it wouldn’t be surprising if you could generate a substantial income stream from your blog. For more on starting a blog check out my article How To Start A Blog. In my article on comparing retirement withdrawal strategies I showed how effective using a lower withdrawal rate in early years greatly increases portfolio longevity and value over time. In an ideal situation, an early retiree would not touch retirement accounts for the first several years, or would at least take out a very small percentage. On a $600,000 portfolio, if the retiree takes only a 2% draw for the first 10 years, and then switches to a 4% withdrawal after 10 years he would have $400,000 more dollars after 30 years. That’s $2,180,000 compared to $1,774,000, assuming an 8% annual return rate. Generating roughly $1,000 a month for 10 years would allow for an amazing amount of growth in the account by effectively requiring only a 2% withdrawal instead of a 4% withdrawal. Most people value a blog at only 2X annual earnings, which means a blog earning $1,000 a month is only worth $24,000. If a blog consistently averages $1,000 per month, this income stream replaces $300,000 in needed retirement savings, when using a 4% withdrawal rate. It is FAR easier to start a blog and get it to the point of earning $1,000 per month than it is to save $300,000. I have made many mistakes and have only blogged super part time for just over 3 years. I am currently earning around $200 per month from my blog. Part Time Work: Currently I work as a contractor for nuclear power plant outages and I also work in the facilities department for a winter snow removal contract. Working outages has allowed me to over the years build up my pay rates and eventually I can choose to work fewer total jobs. In early retirement I plan on working 1 job per year for about 6 weeks. In that 6 weeks I can earn roughly 50% of our target yearly spending, not bad for 11% of the year. Blog Income: I have no way of knowing for sure what my blog income will be per year in 10 years, but given that at the 3 year mark I am averaging $200 per month, I don’t think it is far fetched to plan to be earning $1,500 per month by year 10. This would provide over 50% of our planned yearly expenses. Dividend Income: I am slowly building up my dividend portfolio in my after tax brokerage account. Right now I have this money invested in Betterment 100% stock allocation. By the time I reach early retirement I plan on having north of $300,000 in this account. I will then re-invest this money into dividend paying stocks. At a 3% dividend, I can expect to withdrawal $9,000 per year, an average of $750 per month from this account, by only taking my dividends. Retirement Accounts: I will not touch these until the second phase of retirement at age 60. This will allow for at least 15 years of growth without taking withdrawals. Using a 7% annualized return, the total value in this account should increase by 275%. 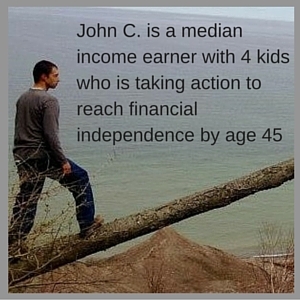 What do you think about using a blog as an income stream in early retirement? For more on my early retirement plan check out my post My Comprehensive Early Retirement Plan. One Response to "Starting A Blog For Retirement Income"
Thanks for sharing your blogging experiences. I am only a few months in, but it’s good to know there’s a chance I might earn a little bit from my blogging some time in the future. In the meantime, I’m just enjoying writing, getting to know my readers, and reading other blogs like yours. With what you are already earning, if you continue creating great content for another decade, I think your projections are probably pretty conservative. Best of luck to you!